MIAMI--(BUSINESS WIRE)--Cult-favorite Chicken Fries now have an added crunch. 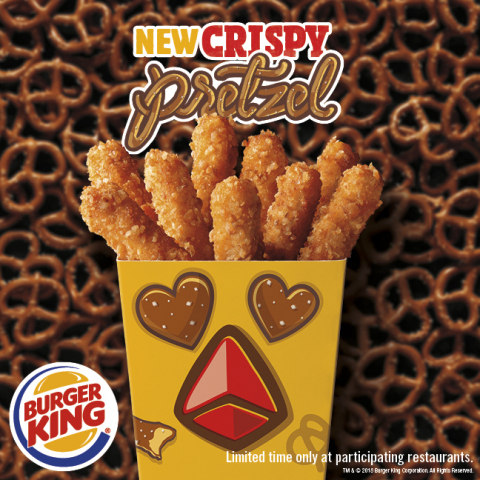 BURGER KING® restaurants are introducing new Crispy Pretzel Chicken Fries for a limited time only at participating restaurants. Made with juicy white meat chicken, Crispy Pretzel Chicken Fries are coated in a salty pretzel breading seasoned with savory spices and herbs. Crispy Pretzel Chicken Fries are shaped like fries and are perfect to dip in any delicious BK® dipping sauces. Crispy Pretzel Chicken Fries begin with boneless white meat chicken that is coated in a salty breading and then cooked to crispy perfection. Available now for a limited time at participating restaurants, Crispy Pretzel Chicken Fries have a recommended price of $3.09. BK® dipping sauces available include BBQ, Honey Mustard, Ranch, Zesty, Buffalo and Sweet & Sour. Chicken Fries will continue to remain a permanent menu item during and after the limited time offer ends.